In part one, we saw how the Microsoft Graph API enables programmatic access to Office 365 groups. Now it's time to let Azure Functions help us with the desired workflow. 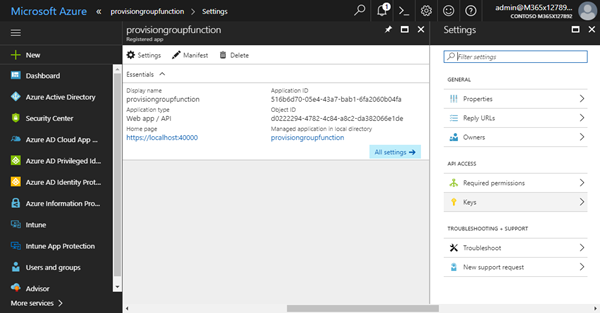 The idea is to use server-less technology to provision an Office 365 group. No worries, we won't need Visual Studio, Visual Studio Code (which BTW are great tools and highly recommended for larger code projects...) or any similar environment. We can perform all necessary steps online directly in the Azure Portal. 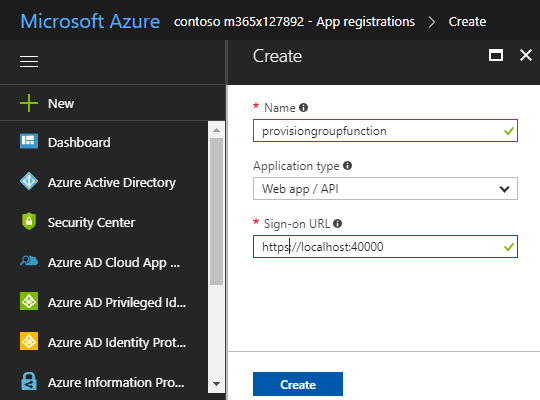 So, let's create the new Azure function and fill it out... We are working with loose coupled architecture, so we can use any Azure subscription which must not be associated with the Office 365 tenant. This approach allows to build "black boxes" and to tie them together as needed easily. In our case, we let the function run in another Azure subscription. The function name shall be "ProvisionGroup". Let's create that with the default authorization level "Function" - we don't want to use a user authorization in our scenario. The function needs to perform several operations. Keep in mind that Azure functions run in a sandbox, to be more specific, in an App service in a Virtual machine. You can use default functionality, but you need to take care if you need to integrate other libraries or modules that by default are not installed in the Windows environment. We don't have any dependencies in our sample. 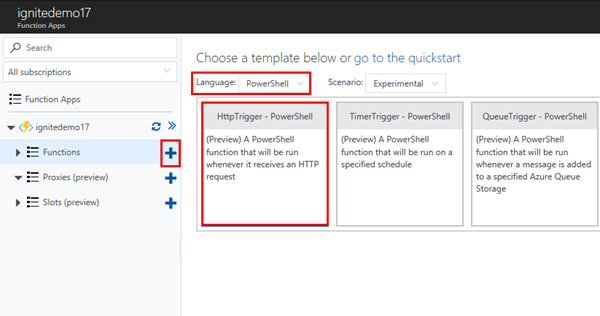 Currently, PowerShell version 4.0 is available. Ok, we also need to store the app data somewhere. Instead of having these values in the code, it's more elegant (and safe) to save these as App Settings. In here, we need to add keys for the TenantID. the AppID and the AppSecret as here. The values must be inserted from the app we created above. Sincerely, I've tried Azure Functions and have some good result with simple operations like list of groups in my account, but for these request, or even I tried events in groups I have always bad request and forbidden; I even tried to assign all the permissions to the account that I use with the function (and it is also the global account of the tenant where the function is..the request instead are versus another tenant, like I suppose in the sample). If I set tenantID, clientID and secretID that are related to the tenant where there is the function, how to retrieve group information related to another tenant? it seems, your app does not have all required permissions for the operation. Have a look at Graph Explorer and change the permissions for adding a new Office365 group and try this in there. 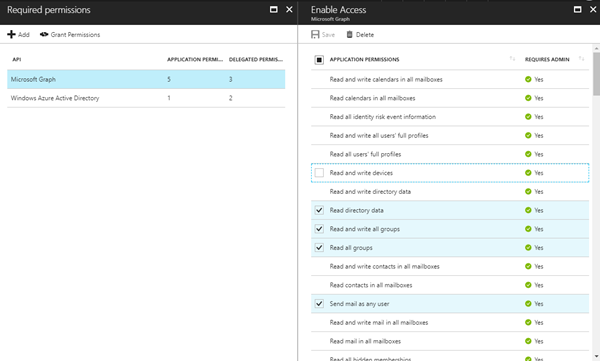 As far as I remember, the app needs to have delegated permissions for reading user mailboxes as well to work properly (will have a look later). 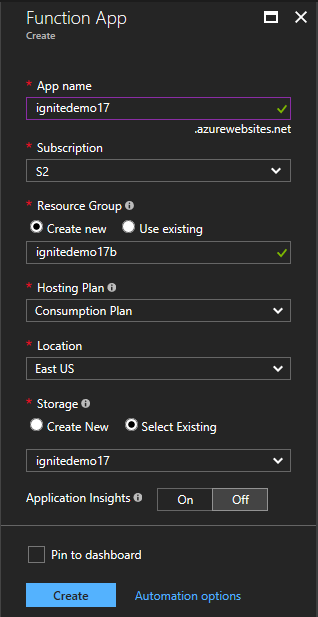 The API needs to have app permissions for the desired tenant. So, you need to have the app registered per tenant, then use the app credentials in the Azure function. You could make it Multi-Tenant if needed, but you need to handle the apps - f.e. in a database and switch them with an additional paramater to the app, or pass these data to the Azure function from outside (but be aware of security). 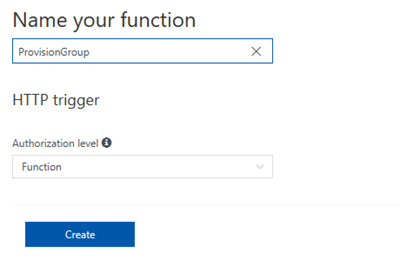 I suppose the issue is related to my approach, i.e., I have created the app in, say, tenant A, and try to access group events in tenant B (the O365 tenant). All the permissions that I set are obvioulsy for the account in tenant A, so when I pass to the function the tenantID, clientID and clientSecret they are all realted to tenant A, so I suppose my app doesn't find nothing related to O365. 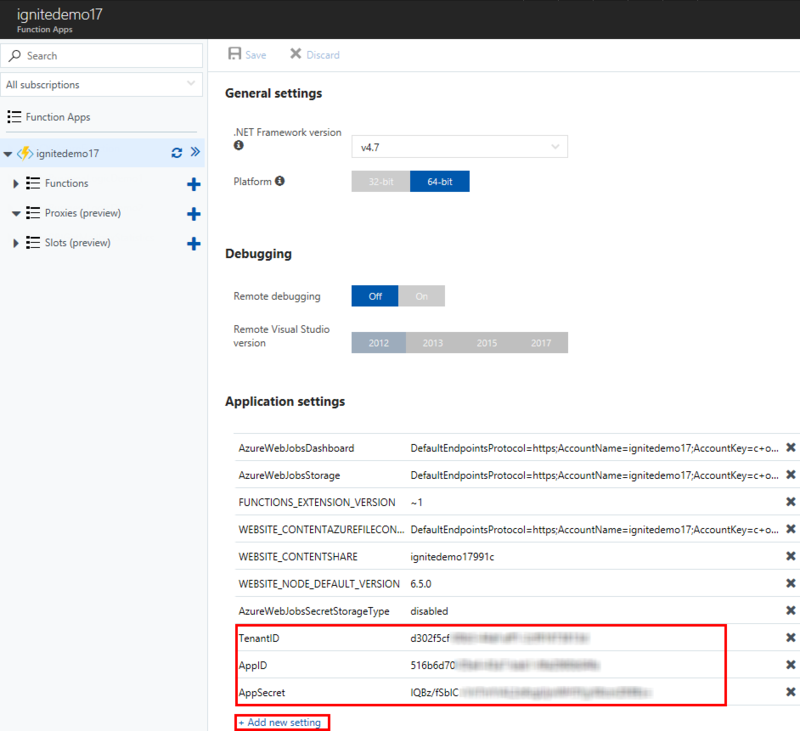 So, if I understand what you say, I have to create the app in the O365 tenant and then use Azure Function in the tenant A with all IDs and secret related to the app in tenant B.
I updated the article with all required app settings. Hope this helps with your app permissions! With these I can see the group calendar events. Now I've seen from your addition that maybe I have no permission on AAD, so I follow your new guidelines and let you know. Thanks for all: it is fun to work with this new technology and also have had the help that you give to me. 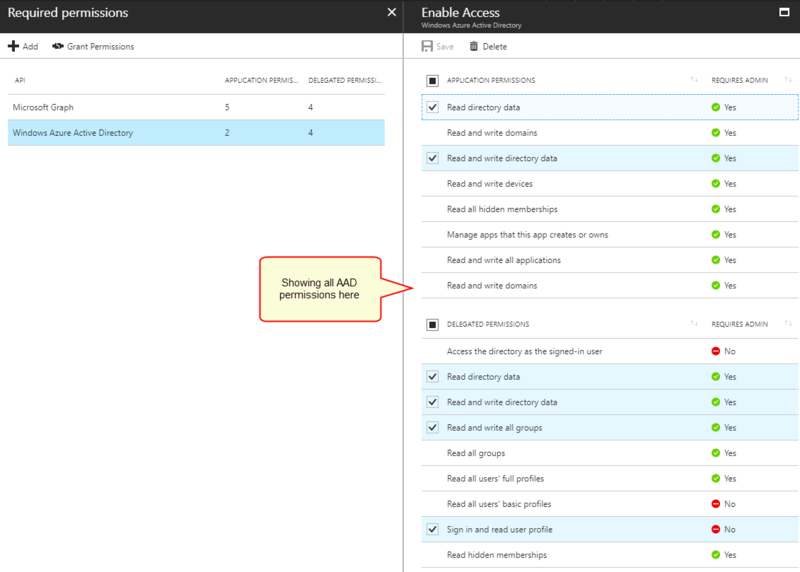 sorry, for the images I see that, for Microsoft Graph, there are 4 items for delegation, but in the image related to the permissions to check they are only 3. 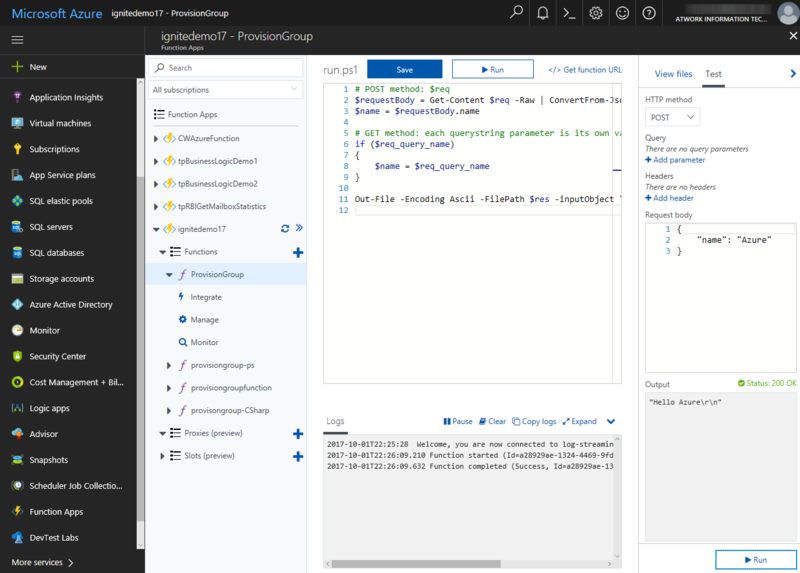 However, it seems that I have no luck and can't resolve it with your code: I suppose it is my problem; for the purpose of conversation, is it possible that it is related to the fact that my app is on O365 tenant while the function is on another? I ask this because, in the sample that I said previously, if I explicitly insert user and password it works. Hello. I am getting the same errors as Marco of Forbidden (403) and bad request. I tried giving the account access to everything and that still didn't work. Can run the commands in the Graph Explorer and everything is fine. I did create the App in the same tenant as where the o365 groups are going to be created. I didn't know if this mattered or not. 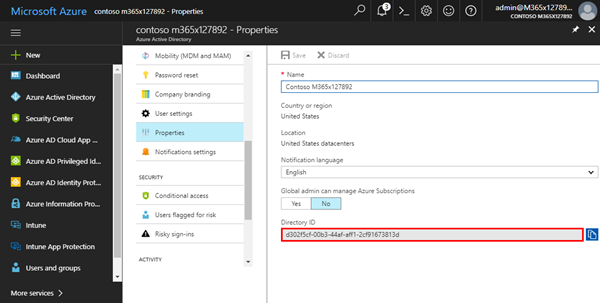 Hi Martina, thank you for the detailed info, I wouldn't be able to setup these Azure functions yet! My friend Serge Tremblay was playing with this post and he asked for help. He had a 403 forbidden error. This was because after "Select more permissions depending..." you should indicated people to click on the "grant permissions" button. This is obvious to people who are used to AAD and OAuth, but not to people that are new to that. Thank you for this solution example. I tried it and it works like a charm. Very appreciated! thanks! Well, you are right, there are many ways of doing the groups provisioning, PnP PS is absolutely a way to go as well. 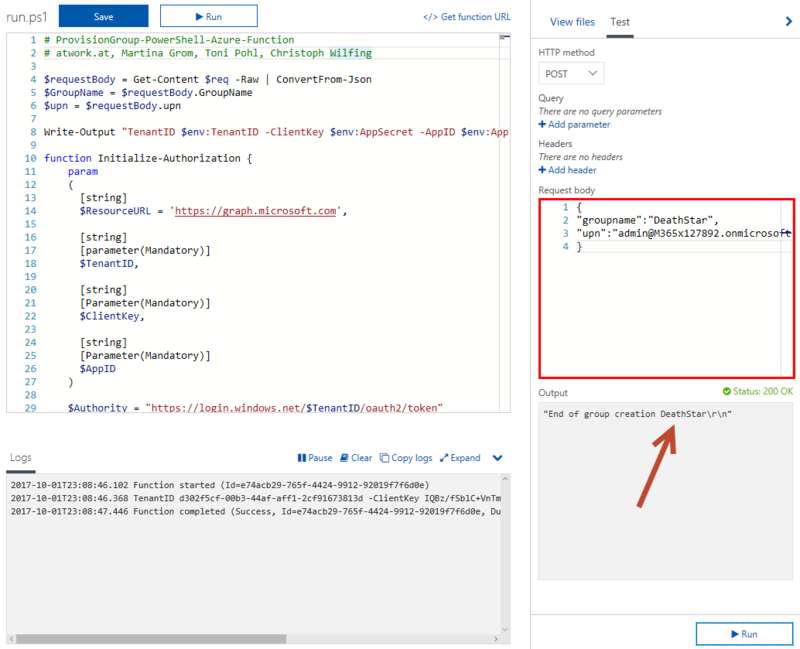 We did use Graph since it provides the unified endpoint for accessing so much more data out of Office 365 services - just as a showcase and maybe as a door opener for looking into other functions Graph delivers. For us, Graph is the key to Office 365 data and services, we wanted to transport that message with that sample. Are you going to develop other functionality/workflows with similar stories? just saw your msg - thanks for the feedback, will add that information about giving the consent with the "grant permissions" button asap! Any plans for creating the same examples but aiming at Microsoft Teams instead of Office 365 Groups? We’d like to implement the same workflow for Teams creation. Just to mention: APIs under the /beta version in Microsoft Graph are in preview and are subject to change. 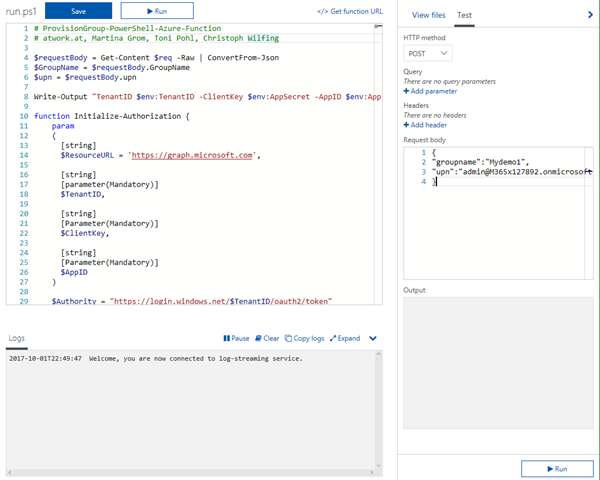 Use of these APIs in production applications is not supported. Hi and thanks for an excellent guide! If I change the charachters to AAO instead it works flawless. Any ideas? Is it some converting problem? ok, thanks for your info. Actually, the JSON body should support unicode characters. Thanks for your response Toni! I have performed a test with some Unicode code now. Comment: As you can see it dosen´t show a "å" in response. 2018-12-27T08:11:53.575 [Info] ERROR! The remote server returned an error: (400) Bad Request. 2018-12-27T08:11:53.638 [Info] ERROR! The remote server returned an error: (400) Bad Request. Comment: Log says it has created a group but thats wrong. thanks for testing. Hmm, I will play around with with special characters as well and contact the PG about that, there must be a way to accomplish that. The error handling could be definitely improved... ;) Will keep you posted here if I find out more!